This bowl gives all the warmth of wood, the comfort feel that a natural object gives you, and never lets you forget it is still part of nature. Hervé de Wergifosse believes that, if we are not responsible for past history, we are responsible for history in the making. 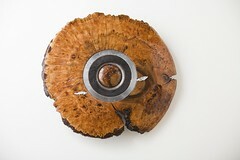 This approach motivates the woodturner when he creates new pieces emerging from 100, 200 or 300 years old fell trees. 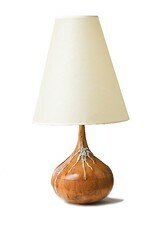 Natural elements have fashioned the timber’s colour, grain and texture. Hervé de Wergifosse’s gouges are using these features to their best advantage to create unique pieces of work to be enjoyed for many more years. Lamps symbolize a light of hope as they emerge from a 300 years old yew tree from Kilmacanogue, whose destiny was uncertain. The “shields” series reflects the struggles through life. We try to protect and defend ourselves against the aggressions. Some emerge with less marks and scars, but no one remains unscathed. 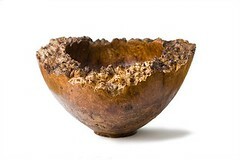 The serrated rough edges of the burr bowls are the results of a tree’s fight for survival against the elements. The amazing grain and texture at the heart of the vessels symbolizes the beauty hidden within us all, each one unique. This is my final piece of Irish Craft that I will display. I get the same feeling from this big chunky bowl as I do from a large bar of Cadbury’s chocolate., my mouth waters! Wonderful batch of artists. YOu could have selected any better. So much hidden talent in the country, but not for long!